I read two articles (among others) on the flight over to Europe yesterday that are worth commenting on. The two articles discussed the role of monetary policy and, in particular, whether the policy changes to address the crisis had achieved their aims. I read these articles as I was doing some computations which would suggest that the main game in town remains fiscal policy. The first article was in the Wall Street Journal (October 4, 2015) – How the Fed Saved the Economy – written by former US Federal Reserve Chairman Ben Bernanke. He claims that the US is approaching full employment because of the ‘extraordinary’ policy innovations that the US Federal Reserve Bank introduced during his period as Chairman. The second article was in the New York Times and argued that monetary policy authorities do not have the necessary policy tools to combat the next crisis. The NYTs article captures the ideological bias that entered policy discussions since the emergence of Monetarism in the 1970s. It makes out that policy is powerless, which is largely only a statement about monetary policy. It is a reflection of how perceptions of what we think monetary policy can achieve are way out of line with reality. But that is core Modern Monetary Theory (MMT). But that doesn’t mean that policy overall is powerless. Governments can always prevent a financial crisis and a recession from occurring if they are willing to use their fiscal capacities. Of course, that capacity is the anathema to the neo-liberals which is really the problem. There is no policy powerlessness. Just an ideological bias against using the available tools properly and responsibly. Ben Bernanke’s article was basically a defense of his record while in that office. I think he failed to defend his record. He said during his tenure the central bank introduced some “extraordinary monetary policies … to help the economy recover from a historic financial crisis”. The Fed has little or no control over long-term economic fundamentals—the skills of the workforce, the energy and vision of entrepreneurs, and the pace at which new technologies are developed and adapted for commercial use. First, by mitigating recessions, monetary policy can try to ensure that the economy makes full use of its resources, especially the workforce … Second, by keeping inflation low and stable, the Fed can help the market-based system function better and make it easier for people to plan for the future. That is the standard doctrine and is highly debatable. Modern Monetary Theory (MMT) tells us that monetary policy (setting interest rates) can “try” to stabilise the spending cycle but it an ineffective tool to do so. Fiscal policy is a much better designed policy tool to ensure the economic reaches and stays at full employment. Monetary policy is what we call an indirect policy tool. By changing interest rates it makes borrowing more or less expensive and this is designed to influence behaviour. But investment decisions such as building a new plant are based on longer-term expectations of the net flow of returns and the current flow of investment spending is not particularly sensitive to changes in current interest rates. Further, no matter how low interest rates go, borrowers will not borrow if they fear unemployment. Firms will not invest if they are worried that consumers will not be driving sales growth. Monetary policy also works through the income distribution – borrowers gain when rates fall but lenders lose. People on fixed incomes lose income when rates fall. What is the net outcome of those distributional impacts? It is very unclear and not even the central bankers know precisely or within reasonable bounds the answer. Finally, the bluntness of the interest rate tool means it cannot have spatial (regional) impacts. Recessions impact through the industrial structure which is unevenly distributed across space. To prevent a spending downturn from generalising policy makers need to inject stimulus into regions that are most affected. Only fiscal policy can do that. 1. “The 5.1% headline unemployment rate would suggest that the labor market is close to normal. Other indicators—the relatively low labor-force participation rate, the apparent lack of wage pressures, for example—indicate that there is some distance left to go”. Remember that prior to the crisis the unemployment rate was in the low 4 per cent range. There was also not the massive rise in underemployment and marginal workers. And the participation rate had not dropped dramatically. In my blog on Tuesday, which assessed the latest US labour market data – US labour market – the recovery is now stalling – I estimated that after taking out the impact of ageing on the declining participation rate, the adjusted unemployment rate was closer to 7.4 per cent at present than 5.5 per cent. I also showed that the US labour market is still some 5.7 million jobs short of where it would have been had it maintained the unemployment rate at the pre-crisis 4.4 per cent mark and the age-adjusted participation rate returned to the pre-crisis levels. Further, the pre-crisis peak Employment-Population ratio was around 63.4 per cent. In September 2015, it stood at 59.2 per cent. That shortfall amounts to 10.5 million jobs that are no longer available and would have been had total US employment maintained its proportions with the growth in the Working Age population. So I conclude that the US is a long way from full employment and not even close to the pre-crisis levels. I agree the doomsayers were completely wrong and for good reason – they do not understand the monetary operations they were allegedly providing ‘expert’ commentary on. Expert these days when it comes to financial and economic matters is a rather stretched term. There was never going to be a major inflation outbreak arising from the low interest rates and the quantitative easing. MMT proponents made that point at the outset. But it is also clear that the US central bank has failed to achieve its ‘inflation target’ and that is because interest rate policy is a poor means of achieving price stability. So overall how would we rate the performance of monetary policy in the US since the crisis? It certainly didn’t achieve its economic goals. But then I don’t think it hindered the achievement of them. It was the timidity of fiscal policy that has allowed the crisis to drag on and the recoveries to be rather tepid. Note he has slipped into a more general statement. No longer is he talking about the achievements of monetary policy alone. He includes fiscal policy in his comparison. And that is not insignificant – monetary policy did very little other than to provide sufficient liquidity to the banking system to ensure deposits were more or less protected. But in terms of its impact on the real economy – sales, borrowing, etc – the ‘dramatic’ shifts in monetary policy were rather benign. The major action and leverage has come from fiscal policy. The reason Europe is still in crisis is because of the fiscal rules (the SGP, the two- and six-packs and the fiscal compact) that the Troika zealots have imposed on the Eurozone. They have crushed spending flows. The US Congress has been trying to follow suit but the dysfunctional nature of American politics has prevented the zealots from having sufficient room to attack the fiscal deficit, which has remained at a size sufficient to support some growth. The overall fiscal deficit in the Euro area is around 2.1 per cent of GDP at present whereas the federal deficit in the US remains around 2.6 per cent of GDP. Both should be larger but the Eurozone deficit should be significantly so. The 0.5 per cent of GDP different is not insignificant. Which brings me to the next article, which bears on this issue. The International edition of the New York Times (October 6, 2015) carried the article – Policy chiefs doubt ability to head off next crisis – which demonstrated the absurdity of the current policy debate and the lack of understanding of the capacities of currency-issuing governments to deal with fluctuations in flows of spending. The article was reporting on a conference held last weekend at the Federal Reserve Bank of Boston. The hypothesis vented was that monetary policy makers are still unable to prevent a crisis such as occurred in 2008 from reoccurring. My own view is that while the use of macroprudential tools holds promise, we are a long way from being able to successfully use such tools in the United States. This allegedly is because the Federal Reserve’s “ability to respond to the outbreak of a crisis has diminished” partly because of legislative changes in the US (2010 Dodd-Frank Act) but more so because the central bank expects “interest rates in the United States to remain below historic norms for the foreseeable future, leaving less room to cut rates, which has long been its first line of defense”. The article quotes a former central bank vice chairman who claims that the central bank doesn’t have the capacity to maintain financial stability. Seven years after the peak of the 2008 crisis, the Fed still has not been able to drive unemployment or inflation back to normal levels. No mention at all of fiscal policy. No one who understands how the monetary system operates and the role of the central bank would have predicted that the various manipulations that the central banks have implemented to spur economic activity would restore anything like full employment. Monetary policy is not a very effective tool to counter-stabilise the macroeconomic spending cycle. The central banks have the capacity to ensure no deposits are lost and in that sense they can maintain financial stability by preventing panics when an economic downturn looms and the credibility of the banks comes into question. And together with the government they can clear out failed private banks, nationalise them, and push the losses on the credit books onto the former shareholders while preserving the integrity and liquidity of the deposits they take over. But to think that monetary policy can reverse a major collapse in the non-government spending cycle is absurd and reflects the neo-liberal mindset that really took shape in the early Monetarist years of the 1970s. Then (as now) there was a growing ideological attack on government fiscal policy and a barrage of mis-information parading as academic studies were published to show that attempts by governments to bring down unemployment through manipulation of aggregate spending (using fiscal deficits) would only cause accelerating inflation. The claim was that the only way that price stability could be maintained was if fiscal policy became passive – the obsession with fiscal surpluses – which, by the way, is not a passive position but a stance that actively undermines the spending cycle via fiscal drag. Monetarists claimed that monetary policy should focus exclusively on targetting inflation and once it was stabilised, economic growth would be maximised. The unemployment rate that would emerge would be the ‘natural’ rate that the economy could support and if that was too high from a social or political purpose then the problem was structural – rigidities introduced by minimum wage legislation or attitudinal deficiencies among the unemployed which prevented them from searching hard enough for work (that is, indolence). The solution was then to start hacking into employment protections, minimum wages, and bringing a big nasty stick out to force the unemployed to suffer – because after all the systemic lack of jobs was their fault! The current debate about the effectiveness of monetary policy is a legacy of all that. The point is that governments have virtually infinite power to reverse an overall spending collapse in the non-government sector. It can simply fill the gap with its own net spending. Fiscal deficits are only constrained by the availability of real goods and services for sale in the currency that the government issues. It is as simple as that. Recessions occur when the flow of spending is deficient relative to the production aims of the firms and the available real productive resources. A spending flow is not a hard thing to get our heads around. We engage in them every day ourselves when we buy things in shops. Some of the papers at the Boston conference last weekend actually demonstrated “changes in interest rates have a limited effect on credit booms in the early stages, and then even that fades away. We certainly do have but the policy makers will not be found in any (over-paid) positions in central banks. The other point relates to the use of the term ‘normal’. There is some belief that after the massive balance-sheet recession that occurred after the years of credit bingeing and financial market excesses that the world will return to the settings prior to the crisis. This overlooks the fact that these settings – the so-called normality – were contributing factors to the crisis and to return to a stable growth path requires us to abandon that sort of behaviour. Specifically, the private household sector has to increase saving ratios – it cannot return to the negative saving positions it was running in the lead up to the crisis. That means consumption growth will be less robust than before. The credit boom also artificially inflated private spending and allowed governments to run surpluses or low fiscal deficits as the tax revenue piled in. So just as the non-government spending patterns have changed so have the required government net spending positions. We are now back to where we were prior to the neo-liberal onslaught where governments will have to run more or less continuous fiscal deficits to support the desire by the non-government sector to save overall. Note I am using saving here in two senses – the first related to household saving from disposable income and the second to the net position of the non-government sector overall which includes firms, households and the external sector. When Modern Monetary Theory (MMT) says that government deficits equal dollar-for-dollar non-government surpluses were are talking about saving overall (the second sense). Finally, the article even bothered to quote the discredited Frederick Mishkin who it seems was at the conference. Remember him? Remember the Icelandic banking crisis, which had its roots in deregulation and privatisation of the banks which saw them expand their balance sheets several times over in the four years to the 2008 collapse. They were aided by flawed credit rating reviews and consulting reports provided by hired academics, which waxed lyrical about the solid state of the economy. One of those academics was Columbia University’s Frederick Mishkin, who featured in the 2010 movie ‘Inside Job’ and was paid a considerable sum by the Iceland Chamber of Commerce in 2006 to produce the report the ‘Financial Stability in Iceland’. At the same time that Mishkin and his co-author were giving the financial system in Iceland a clean bill of health, the Icelandic banks were engaged in elaborate and not so elaborate growth schemes based on refinancing debt with extra borrowing using both accounting mirages and illegal manipulation of markets to allow them to become many times bigger than they could justify on fundamentals. The Inside Job highlighted that the payment to Mishkin was not initially disclosed and thus his Report appeared to be independent academic research, which gave it considerably more gravitas. After the crisis broke, Mishkin was caught changing his CV by renaming the paper ‘Financial Instability in Iceland’. When the Inside Job challenged him about this during an interview, he stumbled, in a dissembling fashion and eventually managed to get it out that it must have been a ‘typo’. Criminals also try to break laws. Sometimes they get away with it. But often they get caught and pay the price. Many of the ‘products’ that the banksters use to leverage profits could easily be made illegal not by regulation but by law. As part of my talk this morning at the SOSTE-Talk conference I looked at some data to see if we could establish something coherent in terms of the relationship between fiscal austerity and the changes in the real economy. I produced the following two graphs. When I have more time I will report on more sophisticated statistical modelling I am doing that provides a more robust story than is portrayed in these graphs. But they are quite instructive as they are. The first graph shows the degree of discretionary fiscal shift across a range of European and other economies between 2010 and 2014. I used the European Union’s AMECO macroeconomic database for ease. They provide a time series for the structural fiscal deficit net of interest payments. So they take out interest payments on debt which the government has little short-term discretion about. They also decompose the actual fiscal balance to separate the automatic stabilisers from the discretionary part of net spending. Remember, fiscal deficits will rise in a recession without any discretionary policy changes because tax revenue falls (at existing tax rates) and welfare payments rise (at existing income support parameters). This is the cyclical component or the automatic stabilisers. 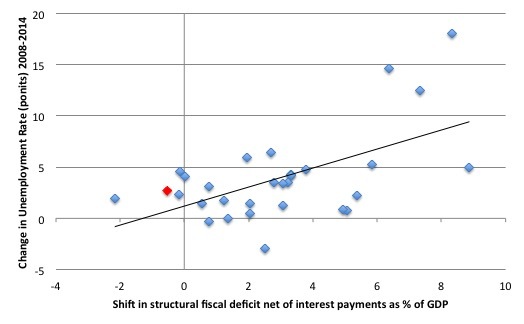 So by netting out the cyclical shifts and the interest payments the remaining measure is as good a guide to the discretionary fiscal policy stance that is available. I should add that the methods used to make the cyclical-structural decomposition are not uncontroversial and allow ideological biases to enter. I have written about this before. Please read my blog – Structural deficits – the great con job! – for more discussion on this point. The measures produced by AMECO are likely to overstate the structural component. But with that probably bias taken as given this data is the best we can get to accomplish this task. A positive shift means a discretionary fiscal tightening while a negative shift indicates the government has eased its fiscal position and chosen to increase its deficit. You can see that between 2010 and 2014, only four nations (Bulgaria, Estonia, Finland, and Sweden) adopted the latter strategy. The erst of the sample engaged in various degrees of chosen fiscal austerity. 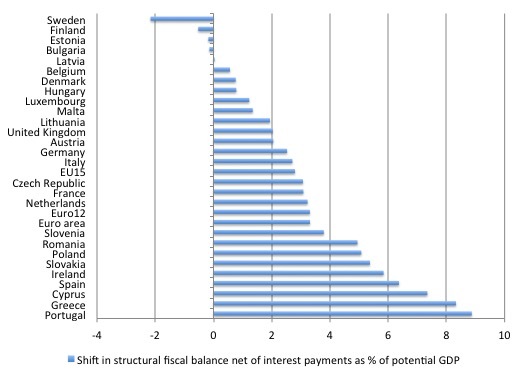 The austerity shifts in Portugal, Greece, Cyprus and Spain are very large. So what has been the impact? The second graph shows the relationship between these fiscal shifts and the rise in unemployment rates between 2008 and 2014. The red diamond is Finland by the way. The straight black line is the simple linear regression which shows a relatively strong positive relationship between discretionary fiscal austerity and unemployment rates. The world economy is slowing as we enter the next cycle. The current recovery has been so weak that the vestiges of the GFC remain. Elevated unemployment and poverty levels, flat real wages, huge private debt levels, and depressed price levels. The authorities failed to allow fiscal deficits to rise sufficiently and remain at the higher levels because they were besieged with erroneous claims about bankruptcy, hyperinflation, and worse from the neo-liberal recession cult. There was no attack when the government payments were saving the Wall Street banks and underwriting the obscene salaries of the executives. That was okay. But once the banks felt they were save and could resume business as usual the attacks came and governments fell in line with their funding masters. The result has been clear. The monetary policy innovations were never going to be effective. There is no operational reason why they should. Today, I am in Helsinki and will address the large SOSTE-Talk conference which brings together the major welfare agencies and providers in Finland who are mounting a campaign against the mindless fiscal austerity that the right-wing Finnish government aided and abetted by the manic Finns Party are pushing onto an economy already in deep recession. My talk is about full employment – what it means and how we achieve it. My sort of topic. Later today, after a train trip, I will be in the regional city of Tampere talking about MMT and the Eurocrisis. Busy! Noticed this kind of empty boasting a lot recently e.g. [Bill edited out link to a spurious WWW site that doesn’t deserve traffic – sorry Bob]. I now totally disagree with this. Fiscal policy entails more centralisation , you see the state as a sentient entity which must be feed to sustain “growth”. The alternative is much more humanistic . To eliminate the cost of financial capitalism by simply giving away the Industrial surplus. The participation rate has fallen significantly. When it returns to the rate when Obama took office you can say things are “good”, never mind 2006/2007. The “money multiplier” lies are still taught. When the textbooks quit lying to students then econ will improve. I recently cleaned a late professors house – he was a book hoarder . The house was top to bottom in books , all of which went into the shredder or my backyard. I will begin reading it tomorrow. It looks and feels satirical as only such observations on capitalistic mobilization can be. I was somewhat disappointed with Richard Murphy in a recent on-line conversation. He’s posted up a blog “Time to get rid of National Insurance and replace it with a progressive consumption tax”. Getting rid of NI is a good idea (its essentially just another income tax for wage earners only) but I’m not sure about the progressive consumption tax. The Brits have enough taxes as it is! So I argued that NI should just be phased out keeping an eye on inflation as that was done. But Richard seemed too hung up on the idea that NI “brought in £115 billion”. Saying “we do not have more than enough taxes if we take £115bn out if the system” which seemed to indicate some underlying neoliberal thought processes. So I did my best to explain how deficits had to exactly equal savings and how budget deficits couldn’t be easily reduced by increasing taxes and cutting spending, and that conversely, cutting taxes and increasing spending wouldn’t necessarily result in a huge increase to the deficit which he was still concerned about! I thought I’d let Richard have the last word which was “I note what you say, but MMT is not always the answer”! The “Scheme for Full Employment” by Magnus Mills is a hilarious and pathetic book at the same time. I discussed the book in this blog – The ultimate boondoggle courtesy of slack government policy – some years ago. I hope you write a full book review for us. Like 5 paragraphs rather than X paragraphs. I am concentrating on lighter stuff , like Roald Dahl little stories (surprisingly hard to find in modern book shops) , Ian Banks (my favourite Scottish socialist writer) and local history books produced by UCC over the years. Hoping he was at least a Guild socialist if not a social creditor. I do my reading in Kerry , a bubble outside internet LA LA land . I will get back to you about what I think or not think but having read the first few dozen pages I like his descriptions of a endless ring road dystopia. A nice sunny day to drive the van but no descriptions of the landscape beyond the endless road. Its the post 1990 Ireland. Have you read Ian Banks greatest book and his personnel favourite . The story orbits around the firth of forth bridge which i circles the world. A linear description of a world in his now deceased head. One MMT paradigm that is a fundamental is the notion that Federal Government spending, budgeting etc is independent of Tax revenue, which financially is just money destroyed. So your sentence- “The credit boom also artificially raised private spending and allowed governments to run surpluses or low fiscal deficits as the tax revenue piled in” seems to say tax revenue does matter to the budget bottom line?? The “bottom line” is just an accounting construct. Taxes destroy money and spending creates money, despite what people say. Red book types admit the books don’t balance during the day and they run overdrafts even if supposedly disallowed, as long as at the end of the day the books balance. I’m a bit skeptical of the notion of a “structural deficit”. It seems to implicitly assume that the government sector is “outside” the economy. In economic terms, it assumes that the government sector is exogenous and not endogenous. But this does not seem credible. A welfare payment is as much a component of economic growth as hiring a police officer or having the government building a bridge or having a corporation invest in plant and equipment. To try to isolate one of these sectors and isolate it from the others seems to me to assume that the “ecosystem” is not integrated. But the “ecosystem” is integrated. There have always been problems with estimating, say, multipliers. But the structural deficit notion only exacerbates these problems. At least with the multiplier you are testing an “experiment”. You are looking for changes in government spending and trying to estimate their impact. This is not perfect. But it is somewhat doable. Trying to isolate a whole sector in an integrated economy, on the other hand… well, I just don’t think that’s credible. It is a bridge too far. I don’t understand why economists do not simply examine the changes in government policy instead of using these structural deficit measures. So, just look at the actual spending cuts that were enforced and how the tax rates were raised. Then build these into an index that can be compared to another country’s index. It is perfectly doable. But it would require some real research work. Suppose that in Ruritania there is an assumed shortfall in aggregate demand of 100 billion. The government cuts taxes by 60 billion on the assumption that the marginal propensity to consume is 80% and the multiplier is 2. It works, and there is now full employment. How can the government know when it has to reverse course and increase taxes again? It seems to me that fiscal policy is reactive. First there has to be excessive unemployment or excessive inflation, and only then can the tool of fiscal policy be used. Is it possible to use fiscal policy in such a way that recessions and excessive inflation do not arise in the first place? Have you seen a soft close drawer working? You push the drawer close fast, and the soft close mechanism takes hold at the last minute gently sliding the drawer into the correct position without a loud crash. That’s what the auto-stabiliser system is for. It is the soft close fiscal policy mechanism for the economy. You let the cyclical part of fiscal policy mirror the business cycle by beefing up the auto-stabilisers with a Job Guarantee. Set discretionary fiscal policy to engage the resources of the economy for the public purpose. Then let the private sector play with the rest of the resources. Finally any resources that the private sector doesn’t want to use at that point are deployed for the ‘nice to have’ public purpose. Perhaps I view life too simplistically, but I ask the question what is economics and government if it does not serve the interests of most people. What most of us did not know before, that the private Banks print money out of thin air. but do now, I conclude that life is very simple, supply and demand are market philosophy which is both unpredictable and irrational. So why waste time pontificating our proverbial naval when government can circumvent the private sector and create jobs as when it needs to, rather than what happens now, where we all sit around waiting for some kindly billionaire to come along and see a profit making opportunity by exploiting our talents. We have the money, we have the human and raw material resources, all we need is the government with the will to do it. We print money directly into the economy dependent on public need, and we raise interest rates and tax to take it out of circulation whilst stopping private Banks from printing money out of thin air. Bill already blogged about South Korean government acting pro-actively to the tune of US 20 billion in fiscal policy to prevent a slowdown. It was his blog entry for july 15 2015. Point being fiscal policy is granular approach you can look at the specific problem in the economy before there is excessive unemployment or inflation. As opposed to just pulling a level that says ‘interest rates’ or ‘narrow definition of QE’ adjusting a global variable on a very complex system. ah the hubris of economists reflects that of man in general. equilibrium,no natural rate of interest ,no automatic stabilizers ,no structural deficit. to flourish.Functional Finance has to try to be dynamic and holistic.